New, large-size edition of top-selling title - over 5 million copies of POSTMAN titles sold. The Jolly Postman delivers cards and letters to various fairy-tale characters. He has a letter of apology for the three bears from Goldilocks, a postcard from Jack for the giant, a solicitor's letter on behalf of Little Red Riding-Hood for the wolf who ate grandma, and so on., There are six envelopes in the book, each containing letters, cards, etc. The Jolly Postman must surely be one of the most innovative and interactive books for young children. 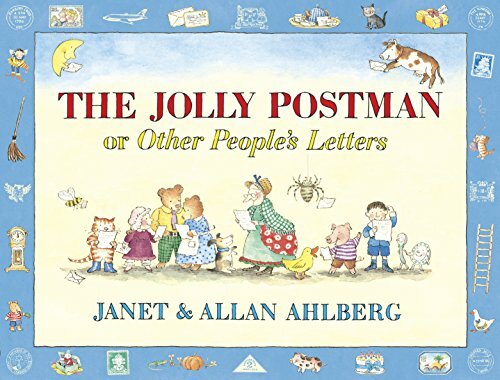 Accompany the Jolly Postman on his rounds as he delivers post to classic children's characters, all of which happily live within his delivery round. Meet the Three Bears, Cinderella (now happily married to her Prince Charming), Goldilocks and many more. The real magic in this book lies in the inclusion of actual and highly personalised post for each character--each tucked into a neat envelope between the pages of the book. Enjoy Goldilocks' "Sorry" letter to the Three Bears, a Postcard to the Giant from Jack and, most amusing of all, the writ issued to the Big Bad Wolf (still occupying Grandma's cottage) by lawyers acting on behalf of both Red Riding Hood and the Three Little Pigs.